No single building in Sukhothai’s ritual center makes many people say “WOW!” But all the buildings together left impressions on me that I’ll always treasure, and they comprise one of Thai art’s most influential works. They also make up a great perspective of the world, which is characteristically Thai, and a great contrast with Western ways of seeing. 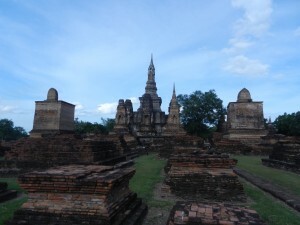 Sukhothai’s ritual center consists of over 150 shrines. 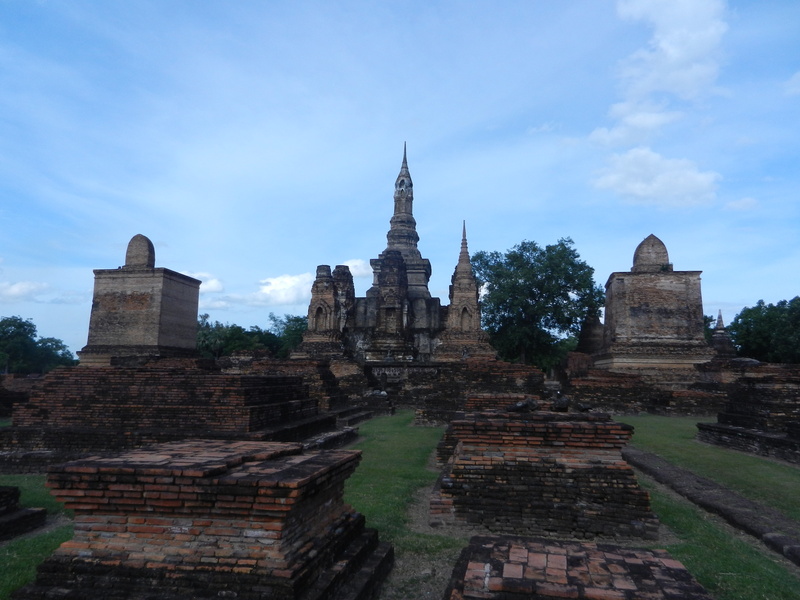 The main one, Wat Mahathat, presides in the center, and monuments for Buddha statues and the king surround it. But the place becomes especially enchanting when you walk around the area. 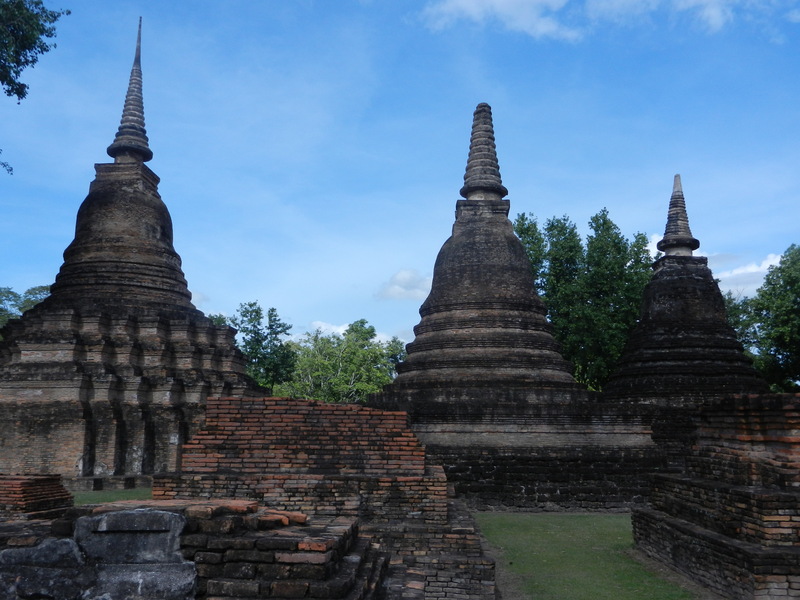 Many of the other shrines were probably built for royal ancestors. Khmers also venerated departed royal spirits, and the honoring of ancestors is common in folk religions all over Southeast Asia. 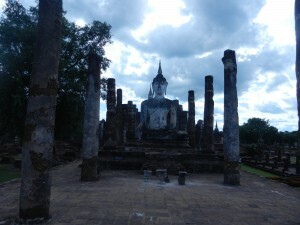 In Sukhothai, Thais turned this custom into a landscape full of gentle forms that dance and flicker as you walk around. Some shrines are in the bell form which Thais adapted from Sri Lanka. This one’s in a handsome octagonal form with fluted corners. This thin pyramid is Mon-style. 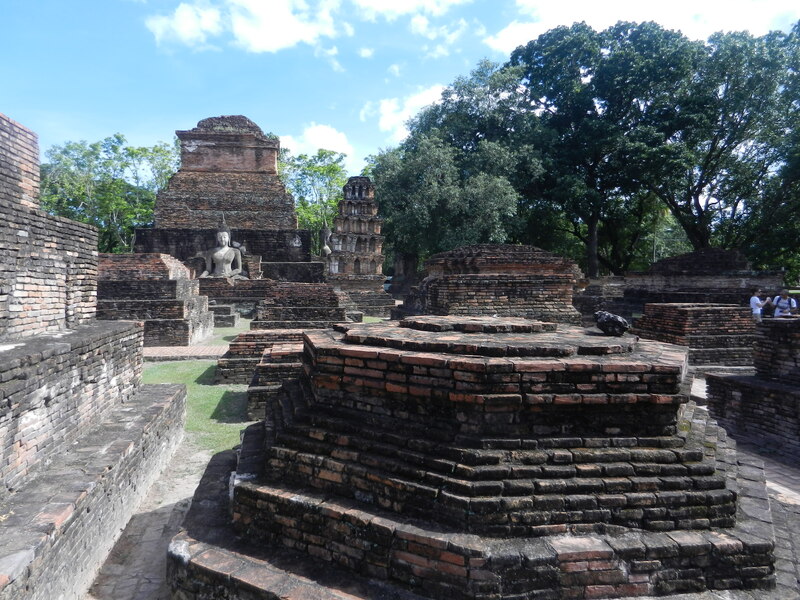 Mon-speaking people lived all over Thailand and in southern Burma, and they had a kingdom in northern Thailand called Haripunchai. The expanding Lan Na kingdom based in Chiang Mai took it over, but the gentle forms in Mon art were incorporated into Thai architecture and sculpture. 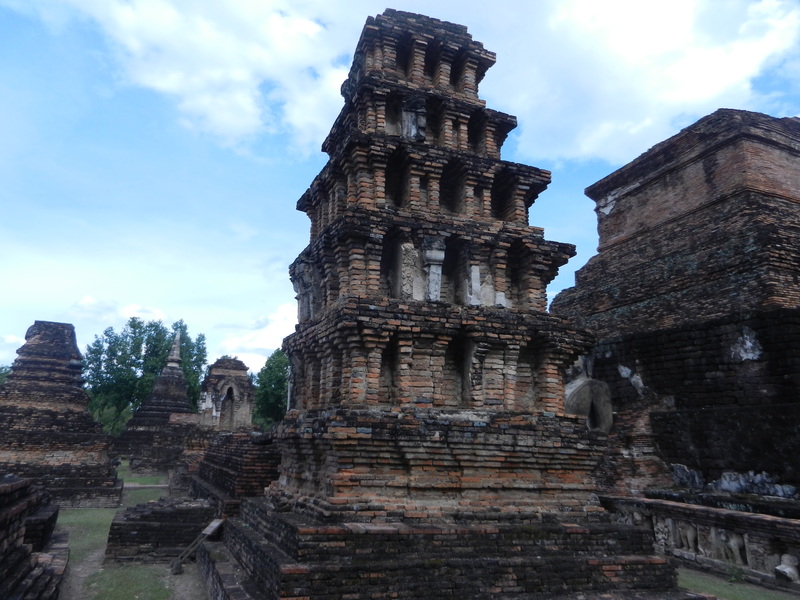 The niches used to house Buddha statues. 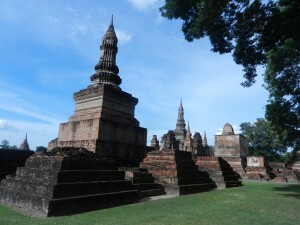 The stupa on the left, with the top in the shape of a lotus bud, echoes the lotus bud-shaped spire in Wat Mahathat’s center–in the middle of the picture. 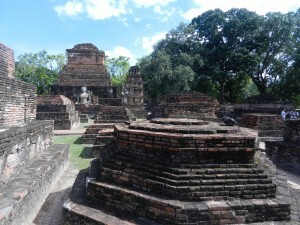 The above shot looks into the remains of the ordination hall (ubosot), which is a little north of the central shrine. 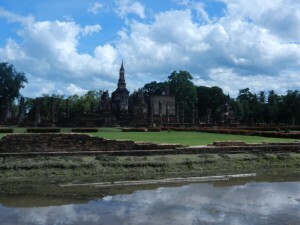 Only monks were allowed in the ubosot, in contrast to the general assembly hall. Though this building was highly honored, its intimate scale added to Sukhothai’s gentle atmosphere. The above photo’s from the west. This area’s especially pretty in the late afternoon–the setting sun gives the shrines softer colors. A lot of Wat Mahathat was restored in the 1980’s, and Thai art specialists aren’t sure about how authentic the work is. Were Thais idealizing their past? 1. A multiplicity of different forms that Thais adapted from several cultures. 2. Perspectives that gently meander rather than hem your gaze into one direction, like the nave of most Gothic cathedrals. Thai art doesn’t stress linear relationships as much as Western art does. It emphasizes inclusive blends of many forms which are in harmony–no wonder why some Westerners find Thai art addictive. 3. As you wander around, the different forms dance and shimmer as though the energies that generate life radiate from them, but in benevolent ways. 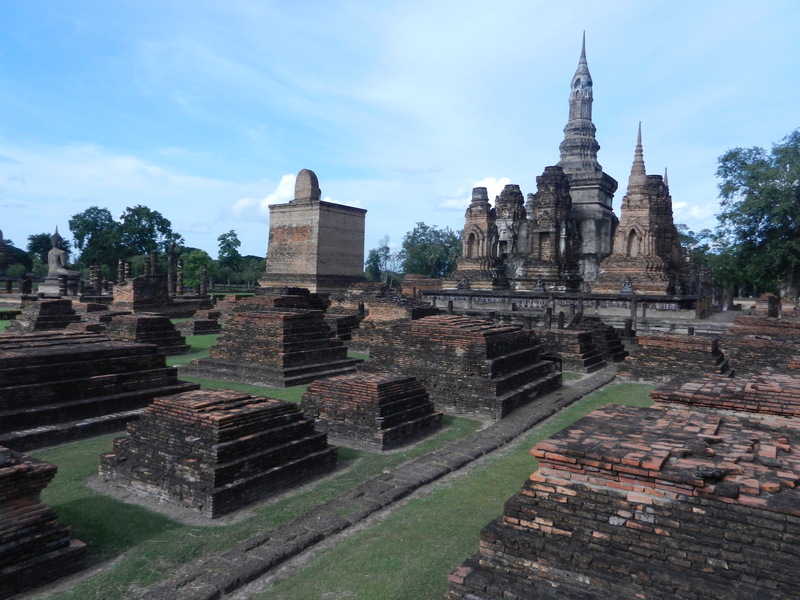 The many ponds around Wat Mahathat add even more dimensions to the interplays. If you linger at Wat Mahathat, you might start thinking it’s one of the most beautiful places people ever created. Thais still hold it as a model for their identities. I called an earlier series of posts “Facts and Dreams About Ancient Sukhothai” but if Sukhothai is a dream, millions of Thais don’t want to wake up. Neither do I. You can go back to the beginning of the Sukhothai dream here. 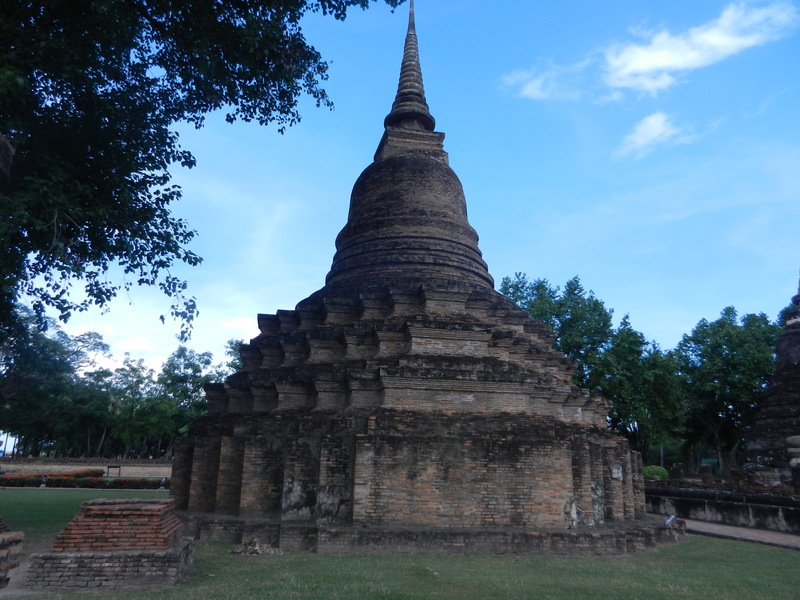 As for me the most impressive temple in Sukhothai is Wat Si Chum.